ESD control on the job and in the workplace requires addressing every potential source of static. 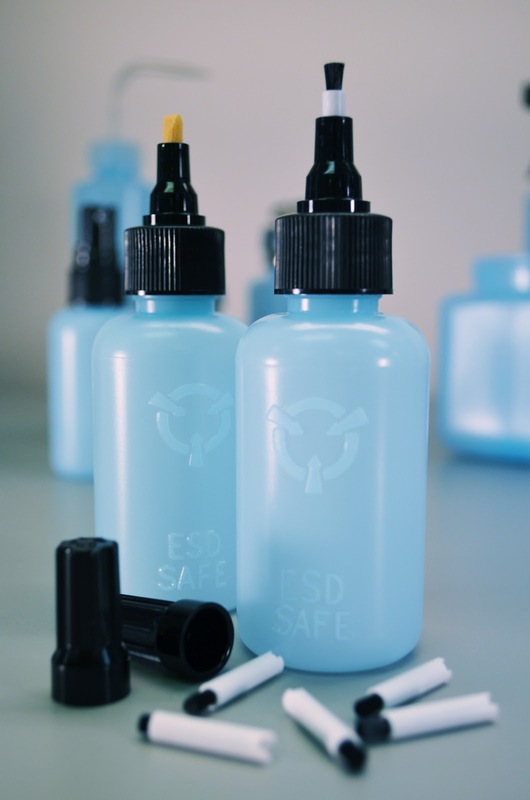 R&R Lotion's line of ESD-safe Bottles and Dispensers helps you address an area of static control that could go without a second thought. R&R takes ESD-safety seriously and has created a new process for creating their ESD-safe bottles and dispensers. Each one is molded of polyethylene in a process that utilizes a concentrate free of any Ethoxylated Tertiary Amine (which is commonly used as an anti-static agent). 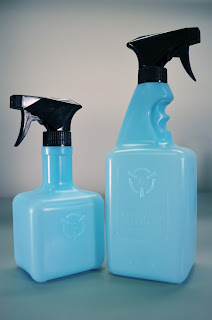 Featuring an average surface resistivity of 109 to 1010 Ω/square, the ability to dissipate a static charge of ±5000V in less than two seconds (at 40% relative humidity), and no chemical reactivity with solvents like TCE or alcohol, R&R Lotion's ESD-safe bottles and dispensers do not have the less desirable characteristics seen with surfactant-laden materials. Tests conducted also showed that the pH of deionized water solutions remained the same before and after a seven-day period and that no color or physical changes were observed during solvent tests. 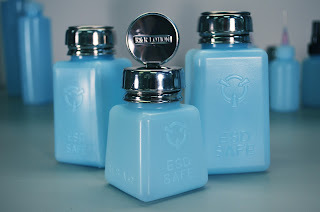 Take a closer look at R&R's complete line of ESD-safe bottles with our Flickr photo set and check back with us soon for an upcoming "On the Bench" video focusing on these quality containers. QSource.com carries all the bottles and dispensers from R&R Lotion and a wide selection of industrial hand lotions, sunscreens, and more. Visit our site to place an order or contact us via phone (800-966-6020) or email for more information.